We all know it can be quite hard to attend work or social engagements with the intention of not drinking alcohol. If you’ve only ever been to social functions drinking, a period of adjustment will probably need to be acknowledged. There’s a few things that can make it difficult. When people ask us annoying and pestering questions it can certainly make it difficult. Some seem to have a natural inclination to pressure people who aren’t drinking. It’s as if they can’t hide their own drinking mask whilst someone else isn’t drinking. I wanted to write an article that provides some perfectly valid reasons you can use at social functions or work engagements that helps end the line of questioning and eases the pressure. Once you have a few of these functions under your belt not drinking, you will see how much better life improves with no hangover, embarrassment or money wasted. All the problems associated with alcohol. Alcohol is super expensive. This provides a decent excuse. Property prices in Melbourne have been skyrocketing for the past 10 plus years, so most know how difficult it is to save for a housing deposit. You can use that angle when people question you as to why you aren’t drinking. If you’ve already got a house, you can talk about how you’re saving to buy a holiday home or to start a business. Melbourne, and the rest of Australia for that matter, are getting more expensive by the day. Everyone understands that and saving money offers a valid reason. 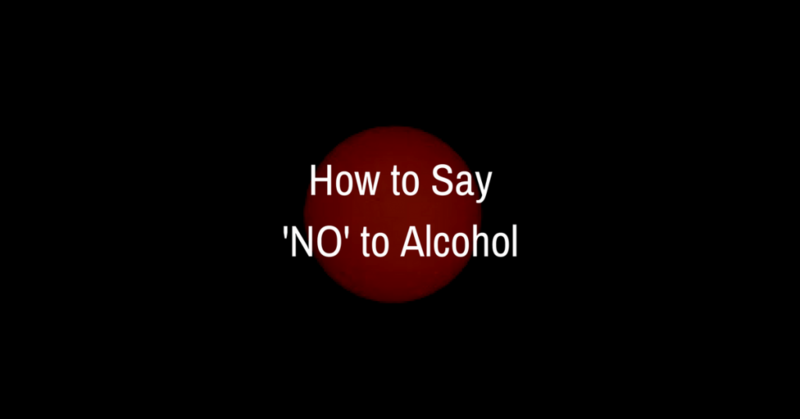 This reason is one of the gold standard approaches in how to say no to alcohol at social events and functions. It doesn’t give anyone ammunition to pressure you into drinking. No one wants to load up the driver with alcohol. They know that doing so would endanger lives. There’s also a few other benefits with this answer. Your friends and family will appreciate the fact that you’re driving them around. They will owe you favors and ‘petrol money’ which are all good things. The other is that you’ll likely get free food, or a minimum, free non-alcoholic beverages throughout the event. If people don’t offer you any of those things, there’s probably no point in socialising with them. Give back to people who give to you. People can’t find fault when you tell them you’re not drinking alcohol because you have to wake early the following day. Many will know what it’s like going to work hungover. It’s horrible and most people can relate to that experience. Pure, simple and effective. Everyone knows that drinking alcohol can make you feel a lot worse if you have a pre-existing headache or nausea. This reason also opens the door for you to leave the party or social function early because people are conscious of the fact that you’re not feeling great. If you’ve only just recently quit alcohol, you’re probably already wanting to leave the party early anyway. This is good to use if you’re entering into new social networks. People from day 1 will get to know you as a non drinker and you’re unlikely to be pressured into drinking at any stage thereafter. You’ll simply be known as the “no drinking guy/girl”. Your identity as a non drinker will be confirmed and reinforced every time you see these people and attend these engagements. This is a good outcome. This is a powerful statement to make. After hearing it, people are unlikely to pressure you to drink no matter the circumstance. If there are some that do, you can pretty quickly wipe them off your list of people to respect. If you are in a state of recovery from alcohol and/or drugs, this is naturally the most authentic and truthful answer one can give. It’s also the most empowering and inspiring to others that are seeking to quit, or to maintain sobriety. Once you get used to saying no, the easier it becomes. If you’re looking into the future and you’re beginning to see yourself as a non drinker, please see your GP. If you’re rehab options, you’re more than welcome to get in touch with the team here at Refocus. You can call us on (03) 9826 0949. – You’re unlikely to make an embarrassment of yourself if you’re completely sober. We all know someone at work who drinks him or herself silly at every event and does this. Maybe this was you in the past. It’s not now if you don’t drink. – You wake up gloriously. No alcohol means no hangover. This is certainly something to acknowledge because it offers energy. Energy to do things the following days such as exercise, shopping or seeing other friends or family. – You save money. Alcohol as stated earlier is stupidly expensive. You save money that can go towards something that brings you long term usefulness.